Cutting paper snowflakes is a great way to pass a chilly afternoon, and it's even easier if you use a pattern. You can create snowflakes to decorate your home, embellish winter greeting cards and scrapbook pages, and generally brighten any winter day. 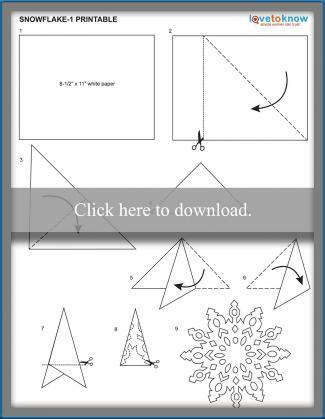 To make your own beautiful snowflakes, you can download these free patterns. This makes a quick and easy craft, so you can expect to create a snowflake in about ten minutes. Older kids can cut these snowflakes themselves, but younger children will need help navigating some of the corners and safely cutting through several layers of paper. Click on the image of the snowflake pattern you'd like to print. This will allow you to download a PDF file of the pattern. Open the PDF file on your computer and print the pattern. 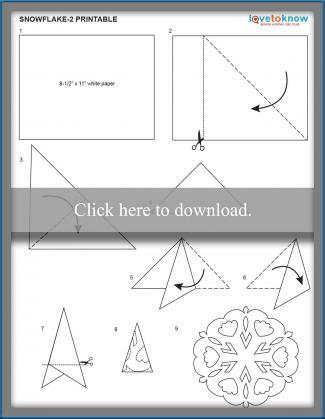 Follow the included instructions to properly fold and cut the snowflake. Print this paper snowflake pattern! Instead of standard white printer paper, substitute printable vellum. You can glue the vellum snowflake over another sheet of paper to create a layered, icy effect. Apply a thin coating of glue and plenty of silver glitter to give your snowflake some real sparkle. This makes a great holiday decoration that can be used all winter long as well. Experiment with the size of your snowflake by decreasing or enlarging the size of the pattern. 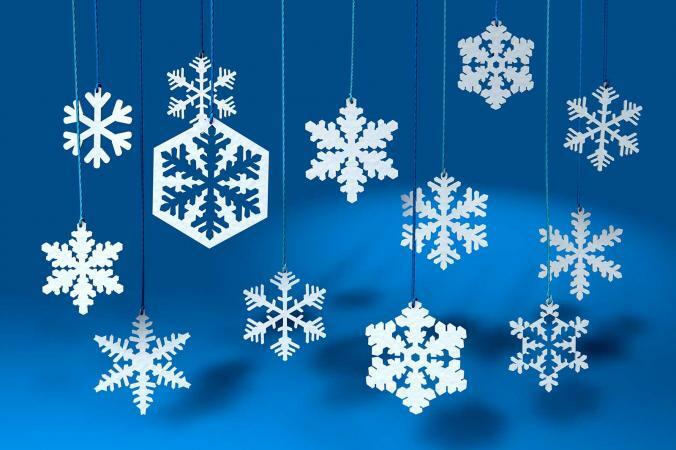 Making lots of snowflakes in large and small sizes will give depth to your window display or other arrangement. Use some matte silver craft paint to give your snowflake some modern shine. Simply paint one side of the snowflake and allow it to dry. Then flip it over and paint the reverse. Cut two identical snowflakes out of scrapbook paper and then glue them together for a cool reversible design. You'll love the flexibility that using a paper cutting pattern provides. You can feel confident that your design will work out, which means you can explore all kinds of creative ideas for your snowflake craft projects.